The government explained the rapidly maneuvering lights as a weather balloon. Experts say there are holes to that theory. 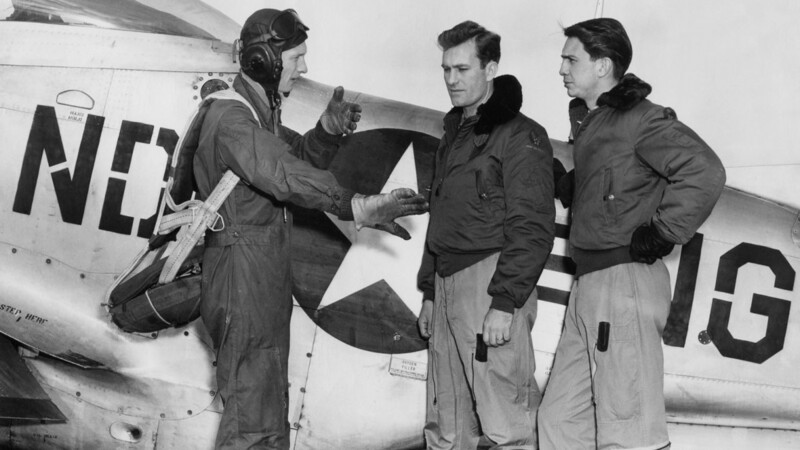 George Gorman, left, discusses his flight over the skies of North Dakota Air National Guard Base at Hector Field with Dan Oxley and Duane Lund on October 2, 1948. 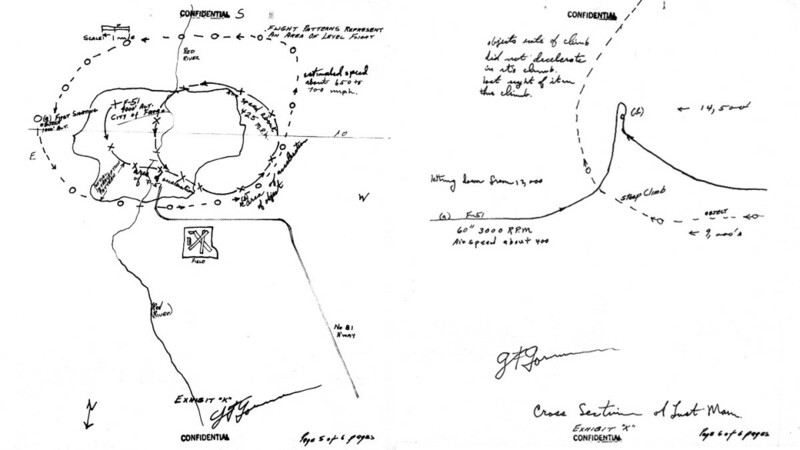 The incident described here, drawn from declassified U.S. government files, provided inspiration for Episode 1 of HISTORY&apos;s series "Project Blue Book." 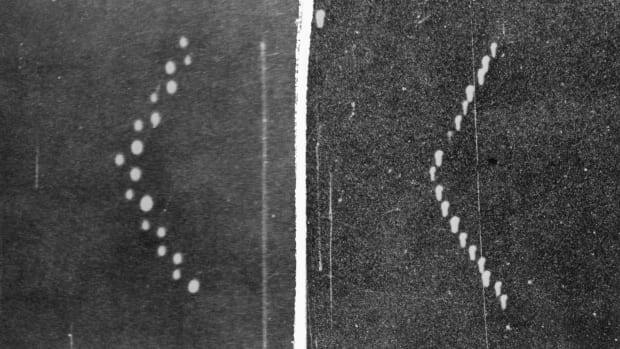 In the words of Captain Edward J. Ruppelt, the man who investigated unidentified-flying-object reports for the U.S. Air Force in the early 1950s, the Gorman Dogfight remains one of the “classics” among UFO sightings. Captain Ruppelt operated Project Blue Book, which continued the work of Project Sign and Project Grudge, a series of hush-hush studies conducted by the U.S. Air Force between 1947 and 1969. His mission: to determine if UFOs were a threat to national security and to scientifically analyze UFO-related data. What makes the Gorman Dogfight unique in the now-declassified pages of Project Blue Book is not only the length of the encounter, but that it was recorded both on the ground and in the sky by numerous reputable sources. George Gorman&apos;s depictions of his UFO encounter. At the time of the incident, Gorman, a 25-year-old former fighter pilot, served as a second lieutenant in the North Dakota Air National Guard. It was this role that placed him behind the flight controls of a P-51 Mustang on Oct. 1, 1948, taking part in a cross-country flight alongside other National Guard airmen. While the other pilots landed at Fargo’s Hector Airport, on that fateful evening Gorman stayed in the air in order to get in some night-flying time in the cloudless conditions. Having circled his P-51 over a lighted football stadium, he was preparing to land at about 9 P.M. Advised by the control tower that the only other plane in the vicinity was a Piper Cub (which Gorman could see about 500 feet below him), he witnessed what he believed to be the taillight of another craft passing on the right, though the tower had no other object on the radar. Deciding to follow, Gorman tried in vain to catch up with the object, reporting that he finally got behind it at around 7,000 feet, where it made a sharp turn and headed straight for the P-51. Almost at the point of collision Gorman dived and said the light passed over his canopy at about 500 feet before cutting sharply once more and heading back in his direction. Just as collision seemed imminent once again, Gorman said the object shot straight up in the air in a steep climb—so steep that when he tried to intercept, his plane stalled at about 14,000 feet. The object was not seen again, but according to Gorman he had been engaged in aerial maneuvers with it for 27 minutes by the time he brought his plane in to land. 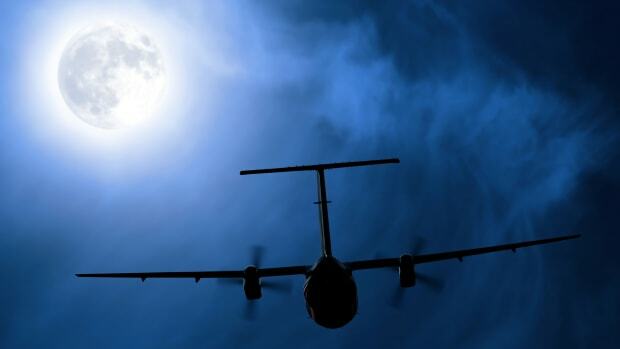 Shaken by the encounter, the pilot went on to report he noticed no sound, exhaust trail or odor from the object. And while he had reached speeds of up to 400 m.p.h. while in pursuit—he couldn’t keep up with whatever it was. 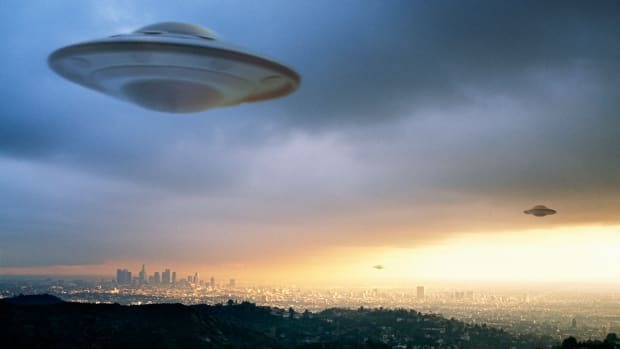 READ MORE: Two Pilots Saw a UFO. Why Did the Air Force Destroy the Report? 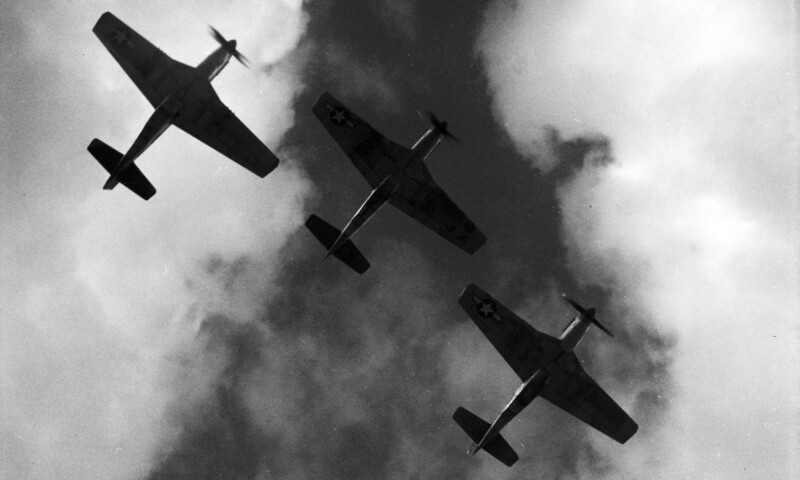 Three P-51 Mustangs circa 1945, the same aircraft George Gorman was flying during his UFO encounter. Dr. A. E. Cannon, the pilot of the Piper Cub, and his passenger also viewed the object—both in the sky and upon their return to the airport, where they immediately joined the traffic controllers in the tower. Cannon described the light as moving “very swiftly, much faster than the 51.” Two Civil Aeronautics Authority employees on the ground also reported seeing the object. Could it have simply been another aircraft? Taking the technology of the time into account, Dr Travis S. Taylor, aerospace engineer and author of Introduction to Rocket Science and Engineering, believes any other aircraft would have been apparent to Gorman. U.S. Air Force investigators from Project Sign (later to become Project Grudge and ultimately Project Blue Book) soon arrived in Fargo, where Geiger counter measurements of Gorman’s plane revealed heightened radioactivity, though this was later explained away as a side effect of the high-altitude flying that took place. A model of a R-1, the first Soviet guided missile. What about Cold War testing? One conspiracy theory speculated that Gorman’s encounter may have been with a top-secret test craft. 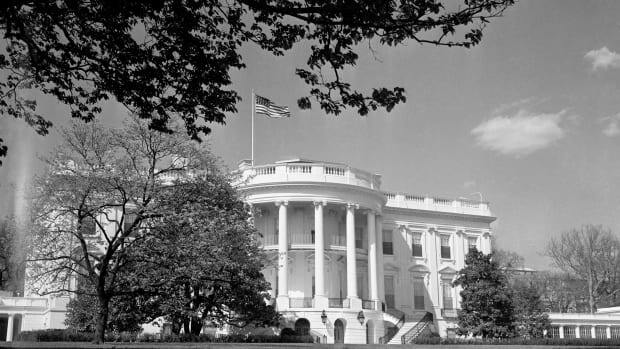 With World War II a very recent memory, tensions in 1948 were heightened both in military and civilian circles. 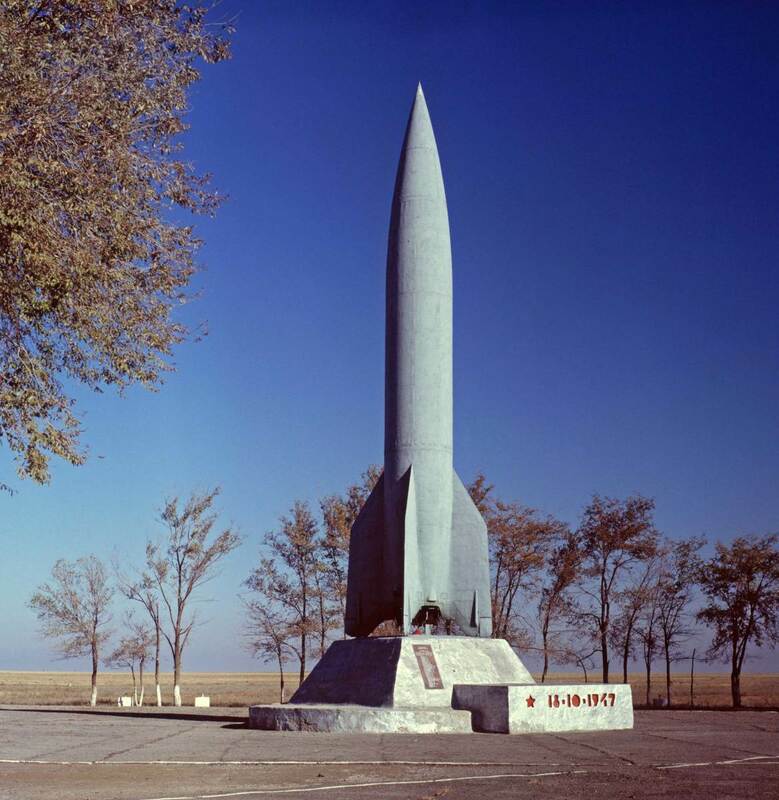 And as the Cold War tightened its grip on the American psyche, the U.S government sought to boost its scientific firepower with a clandestine initiative called Operation Paperclip, through which it recruited former Nazi scientists, engineers and technicians (including Wernher von Braun and his V-2 rocket team) to America, to boost the nation’s chances in the Cold War and looming space race. Back in Fargo, after the Air Weather Service revealed it had released a lighted weather balloon 10 minutes before Gorman first saw the object, investigators pounced, proclaiming the balloon the likeliest explanation for the object seen. As for the seemingly incredible movements witnessed, the report said those were due to Gorman’s own maneuvers as he tried to chase the bright object. Essentially, investigators wrote, his high speed gave the balloon the appearance of moving in opposite directions as he passed by. Added to that theory, investigators noted the bright appearance of Jupiter on that date, hypothesizing that Gorman had been attempting to chase the bright dot of the planet at the same time the weather balloon was in range. 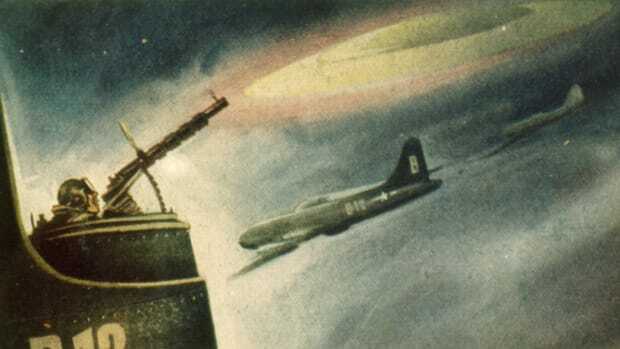 Video: Experts recount the puzzling 1948 dogfight between World War II pilot George Gorman and a UFO, which was investigated by Dr. J. Allen Hynek. The lighted weather balloon would become the official cause of the encounter in the Project Blue Book file. “We were doing Project Mogul at the time, which was high-altitude balloons [fitted with high-powered microphones] that we were trying to listen to see if the Soviets were doing above-ground nuclear testing,” says Taylor, who points out that the famous Roswell, New Mexico UFO sighting was explained away as a Project Mogul balloon. Whether Gorman was happy with the official outcome remains unknown. Maintaining his silence, he returned to the Air Force full-time, eventually retiring at the rank of lieutenant colonel in 1969. He never spoke publicly about the encounter again, though according to The Bismarck Tribune, he did tell friends “he was never convinced that he had been dueling with a lighted balloon for 27 minutes.” Gorman died in 1982.